Now you may have gathered by now I like the little shows, rallies and events, whereas our erstwhile midlands photographer Yoda loves the big brash and bright lights events due to his magpie tendencies to shiny things or is it just the fact his wheelchair sinks, and I may have found one of those hidden gems in the Inner Circle Rally Club Goosing the Fox Rally. The sort of event where there is a pub, called the fox and goose hence the rally name, bonfire, beer, silly games, bands and likeminded people. The Inner Circle guys being regulars at many events near and far, indeed one of them was leaving early on the Sunday to head for the Faro Rally and then via the Mediterranean to the Bulldog bash, now that’s keen and almost my sort of directions, although I would just head up the M40 for the Bulldog, but will leave such sparkly events to Yoda. Thinking of directions too it was nicely signposted too which is always a plus for a Bosun. Held on one of the busiest rally weekends in the year, when there was lots of choices there was a great turnout. Held in a picturesque village in Hampshire it also makes for a lovely setting, sadly although I had remembered my suntan cream, bringing some anti nasty midge spray would have been handy as I was bitten to death, maybe it’s the lynx affect, I was glad I wasn’t camping, though as I would have just ended up a mass of red whelts, however it was such a friendly do that it is tempting to return. Now in its second year the rally crew were pleased with the way the event has become something that people already want to return too and there is already talk of no3. 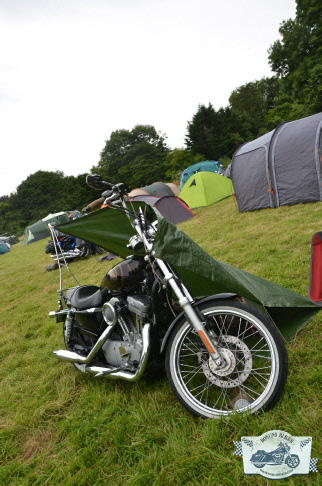 As ever at such events the rally field had an eclectic mix of bikes and characters, I loved the old school rallying by sportster owner “Harry the Cuban”, with just tarpaulin and bivvy. The superb swirley gold leaf tank artwork on his bikes tank also being his own handy work and first attempt too well done that fellow. There is always a strong smattering of triumphs 900 triples at these events which is a great rally tool and I have always wondered why triumph stopped producing it, and probably why they now command good prices second hand. Also in the car park was a very clever owned for 20+ years motoguzzi, with lots of trick parts including a remote ignition, and the panther and sidecar that I yearn for with compass satnav, however I would be banned from owning such a thing, for it has the incorrect amount of wheels for a Bosuns riding and driving skills . 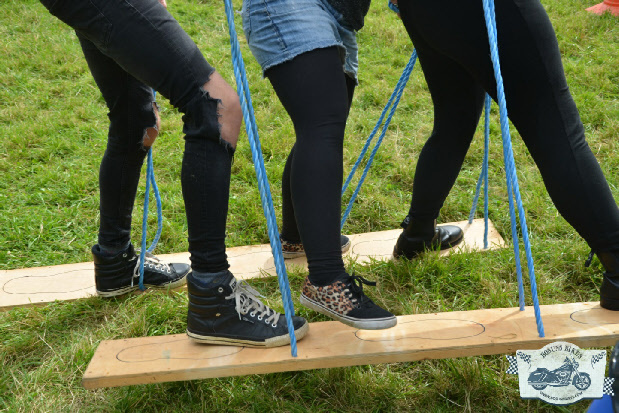 Without too much persuasion from the crew the afternoons silly games started and with a prize of beer on offer, this somehow does bring volunteers forward quite quickly, firstly for walking the slippery sheets etc we ignore the silly cheating too as who cares when having fun. We shall gloss over the blindfold plank walking team almost knocking down the marquee due to steering inabilities. On a really positive note there were lots of new people to the rally scene at the event, and they were all having a great time. , I find this great for the future of the scene along with a recent influx of learner riders at rallies and shows, and the friendly welcome and relaxed “rally virgin” games here will hopefully keep seeing them coming back.